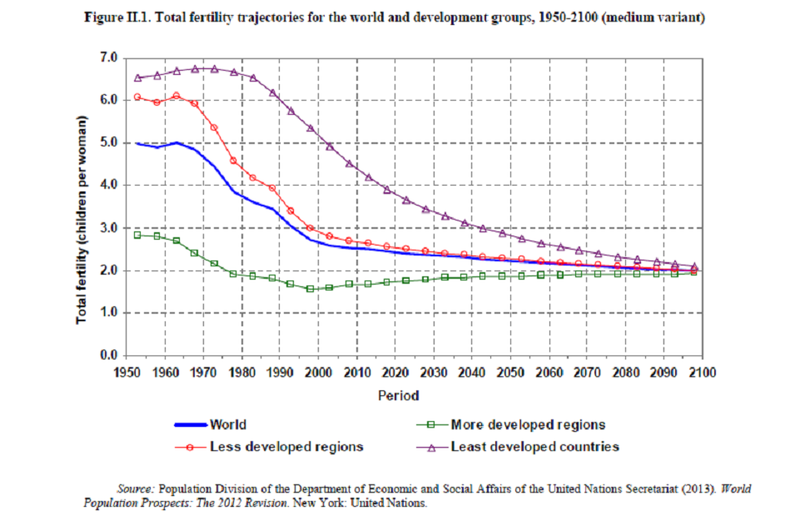 The 2012 review of the UN’s World Population Prospects was released in August this year. Charts are still – presumably – being prepared since the interactive charts from the 2010 review are no longer available on the UN site and have not yet been replaced by new charts. The basic picture is still of fertility rates decreasing steadily with the medium scenario giving a world population stabilising at about 10.8 billion around 2100. 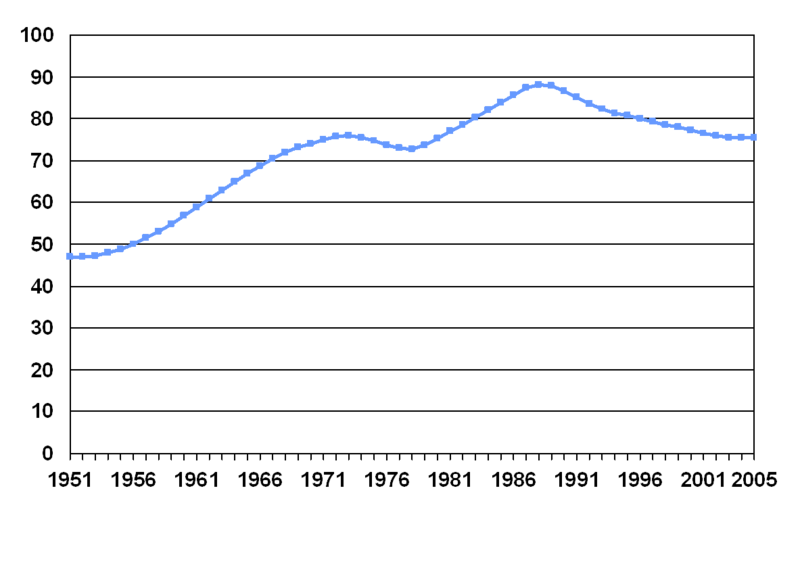 Chinese population is just about at its peak and will now be reducing till 2100. 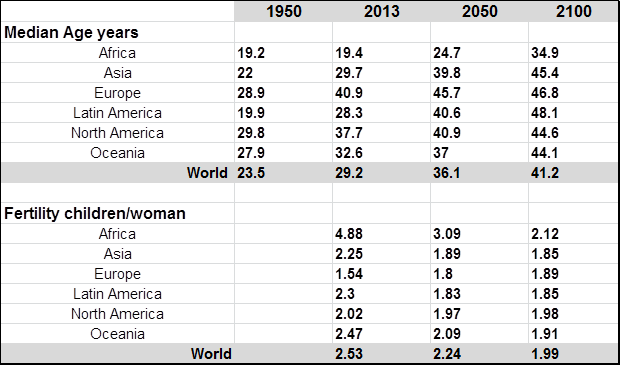 Indian population will reach its peak around 2060 and then start declining. 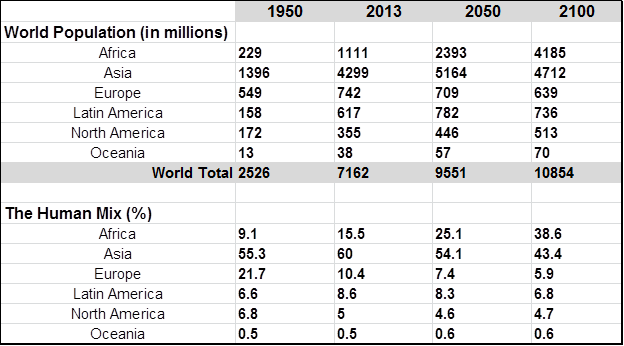 African population will reach its peak only around 2100. There is a massive amount of data and projections, and the interesting thing about demographic forecasts done on this scale is that the “inertia” is high. Consequently much of the “forecast” is inevitable and the key parameter is the fertility rate. In 1953, 99.9% of the world population exhibited a fertility rate greater than 2.1 children per woman (the static population replenishment rate). Now in 2013, 49% of the world’s population have a fertility rate lower than 2.1. Half the world’s population is already shrinking. By 2100 this will be 81% and the world population as a whole will be shrinking. A significant proportion of those under ten years old today will still be around in 2100. Today about 20% of the world population is under 10 years old ( approximately 1,400 million). In 2100 around 8% of 10.8 billion will be over 80 years old. Assuming that say 3% are older than 87 years, it would mean that 320 million (or 23% of those under 10 or about 5% of everybody) living today will still be around in 2100. Today about 14% of the world’s population is over 60 and about 2% are over 80. By 2100, 35% will be over 60 and about 8% over 80 years old. The 950 million over 60 today will become 3,800 million by 2100. More than 800 million people will be over 80 and I would estimate that around 1% of these – or 8 million – could be over 100 years old! Bloomberg (2012): Unicharm Corp.’s sales of adult diapers in Japan exceeded those for babies for the first time last year. Just the demographics is changing the make up of the world and its genetic mix. The human genetic pool in 2100 will be geographically placed 40% in Africa, 40% in Asia with the remaining 20% spread between The Americas, Oceania and Europe. And while there will be some migration and genetic mixing, this basic distribution will be maintained. Moreover, fertility rates will be stable and close to (even if just under) 2.1 in all regions. Median age is also on the way up world-wide. The twentieth century witnessed the most rapid decline in mortality in human history. In 1950-1955, life expectancy at the world level was 47 years and it had reached 69 years by 2005-2010. Over the next 40 years, life expectancy at birth at the global level is expected to reach 76 years in 2045-2050 and 82 years in 2095-2100 (table III.1 and figure III.1). The more developed regions already had a high expectation of life in 1950-1955 (64.7 years) and have since experienced further gains in longevity. By 2005-2010 their life expectancy stood at 76.9 years, 10 years higher than in the less developed regions where the expectation of life at birth was 67.0 years. Although the gap between the two groups is expected to narrow between 2005 and mid-century, in 2045-2050 the more developed regions are still expected to have considerably higher life expectancy at birth than the less developed regions (82.8 years versus 74.8 years). Throughout 2010-2100, systematic progress against mortality is further expected to increase life expectancy at birth up to 88.9 years in the more developed regions and 80.8 years in the less developed regions thereby further reducing the gap in mortality between the two groups. What occurs to me also is that famine, disease, war and the effects of natural catastrophes are becoming less and less relevant demographically. But I shall return to that subject in another post. So while population has increased by a factor of 2.3, the food available per person has increased by about 30%. Of course there are many millions who still suffer from malnutrition but this is primarily due to poverty and a failing of distribution systems. It is not the availability of food which has failed. The proportion of the population which is under-nourished continues to steadily decline. Posted in Alarmism, Demographics, Food | Comments Off on What food crisis? In China the youth (age 15 – 24) population is already declining. In India it will keep increasing till about 2050 and then decline. In Africa it will be growing until about 2100. Most of the youth of today will not be around in 2100 but the youth of that time who will see the world through to 2200 will be 500 million each in Africa and Asia and less than 300 million in the rest of the world – subject of course to any geographical population shifts that might take place. In the period till 2100 such migrations will probably not be so significant. Prescient? I wondered. There is no shortage of forests, climate continues its normal cycles, some species have died and new ones found and the world has become richer and cleaner. No, just a depressed Russian of the 1890’s, and one without hope or any belief in the ingenuity of humans. Not prescient, just another alarmist now proven wrong. And his kind of Malthusianism is alive and well even today – and is just as wrong. In 1897 the world population was 1.5 billion with about 60% living in poverty. Life expectancy was about 32 years (average). At that time some 600 million people were being fed clothed and supported in a reasonably satisfactory way. In 2012 the world population has grown to 7 billion with about 25% still living in poverty (and the threshold for poverty has changed drastically). Average life expectancy is now 67 years. Today some 5 billion people are fed and clothed and supported in a reasonably satisfactory way. Almost 10 times as many as in 1896. In another 120 years the current sayings of the Malthusians, the climate alarmists, the energy alarmists, the food alarmists, the resource alarmists and the bio-diversity alarmists will seem equally ridiculous. 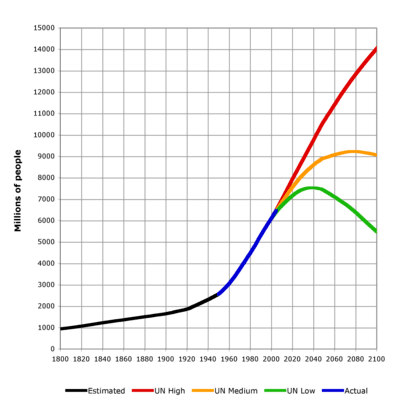 World population will probably stabilise at about 10 billion (at the current rate at which fertility rates are reducing) in the next 50 years or so. The challenges then will be the complete eradication of poverty and the biggest barrier may then be a shortage of “working” population. By 2140 we will be close to 2.1 children per woman, studying longer (say till 27), working for 45 years (till say 72) and living much longer – say 85 years (on average). Maybe less than 5% of 10 billion people will be living in poverty. Hunger and malnourishment will have almost disappeared. It may well be that it is the proportion of “working population” which becomes the limiting factor in satisfactorily maintaining the young and the elderly. 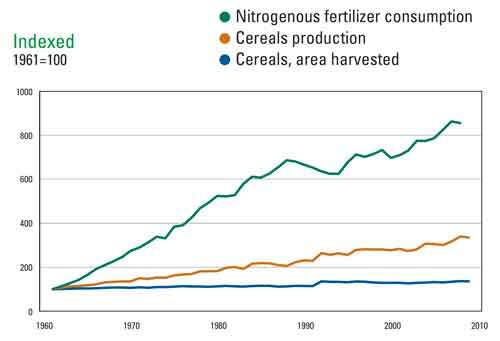 But there will still be no Malthusian resource crunch. With both landmass and population concentrated in the Northern hemisphere, a northern-centric view of the world in most things is inevitable. 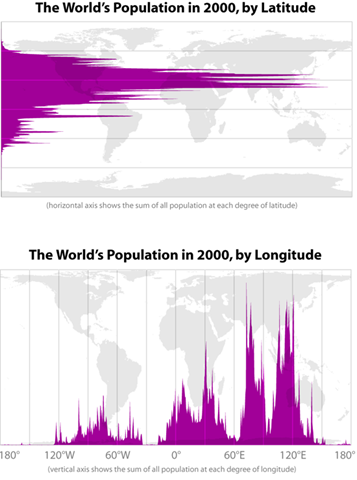 I was looking for some information on population distribution by latitude and came across this graph on Chris Blattman’s site. However he was not the source of the diagram but had obtained the image from Paul Kedrosky’s page which still exists but no longer has the image. He in turn referred to a Bill Rankin whose page no longer exists. The diagram is said to be from 2000 data but I have not been able to find the source or anything more recent. An excellent diagram. More fun with numbers! Roughly 88% of the world’s population lives in the northern hemisphere, and about half the world’s population lives north of 27°N. Taking the northern and southern hemispheres together, on average the world’s population lives 24 degrees from the equator.